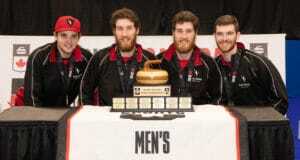 The Jones team, the defending Home Hardware Canada Cup champs, scored a deuce in the second, stole three in the third and added three more in the fifth en route to a 9-4, eight-end win. 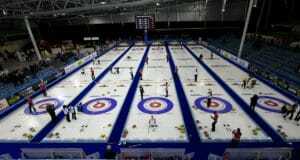 That sent Jones and her teammates – third Kaitlyn Lawes, second Jocelyn Peterman and lead Dawn McEwen — to a share of top spot in the standings with Casey Scheidegger of Lethbridge, Alta., and Kerri Einarson of Gimli, Man., all at 3-1. Homan drops to 2-2 and into a battle for a playoff spot. It was an important bounce-back win for Jones after losing 6-3 to Einarson in the morning draw. For Homan, third Emma Miskew, second Joanne Courtney and lead Lisa Weagle it was just one of those difficult games they’ll discard and move on. “Yeah, it was a tough game. We just didn’t catch up on the ice,” said a disappointed Homan, who had some chances for multiple points later in the game but couldn’t force the Jones team into any costly misses. Homan stole a single in the first end but before her team had time to even think about sprinting into a lead, Jones came right back with two in the second. In the other women’s games in Draw 6, Einarson scored three in the 10th to score a tough 8-7 win over Darcy Robertson of Winnipeg (1-3), while Scheidegger and her team continued their impressive play with a 12-2, eight-end win over Allison Flaxey of Winnipeg (1-3). On the men’s side Kevin Koe of Calgary (3-1) got past Reid Carruthers of Winnipeg (0-4) 4-2 while Brendan Bottcher of Edmonton (3-1) beat Matt Dunstone of Regina (0-4) 8-6. The 2018 Home Hardware Canada Cup continues with draws on Friday at 9 a.m., 2 p.m. and 7 p.m. (all times CST). 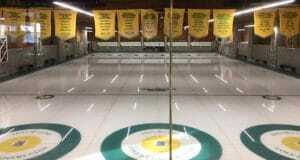 The Home Hardware Canada Cup format calls for the men’s and women’s teams to play a three-day round robin, with the first-place teams advancing to their respective finals on Sunday, while the second- and third-place teams meet in semifinals on Saturday, after any required tiebreakers, to determine the other finalists.